Absorb is an audio-based installation that attempts to reconcile an essence of human presence in the seemingly disconnected realms of technology and the biosphere. It is a response to the hard-to-grasp realities of rapid global wildlife and habitat loss that parallel a simultaneous explosion of human populations and especially their technologies, which seem, at first glance, to be propelling human being-ness further and further from communion with its evolutionary origins in water, bacteria, sponge, and fish, and toward something “unworldy” and cyborg-ian. Sometimes the simplest response is to step outside to listen, to breathe and to let loose a primal voiced echoe. The scores of Absorb pose a set of instructions that assume and invite cellular and ancestral memory responses, or codes, from participants. Recognizing that all technologies are formed from earthly materials, the composition of Absorb asks how those coded responses might be seeded within, pollinate, or infect the networked and digital media that the composition carries into a venue. What fragments of the blood, breath, waters and essences of those from which we came, can we perceive in the winds, waters, in rocks, earth and flora around us? What of these fragmented essences, are present in how our cells function, how we breathe, walk, move, speak and think? And what of these ancestral essences, these codes, do we project into, or can we detect in, our technologies? The responses, extracted from their origins, fragmented, mixed and processed digitally, populate the installation space, juxtaposing the ancient organic realm of telepathy with the futuristic wired realm of telematics. Disconnected echoing digital seed-codes of listening, breathing, intending, voicing. The audio of the first “parent” recordings of Carried on Your Winds and Flowing on Your Tongues was made from the sounds of artists from Canada, the United States and Europe, who were invited to respond to the scores remotely by digitally recording their breath and voice sounds, respectively. Their audio files, sent through the internet, were edited and processed into two long form sonic pieces. In each location where the project is installed, more contributions are gathered, rendered and mixed into the whole. * For the installation at ohrenhoch, visitors are invited to consider their own realization of the scores. Those visiting April 8 and 15 have the option of individually recording their breath and voice with the help of ohrenhoch. Their recordings will be rendered by Tina Pearson and included in the final two installation dates April 22 and 29. All 'Audio Field Reports' can be heard on headphone in the ohrenhoch archive space! Tina Pearson is a composer, performer and facilitator in new music, sound art, and networked performance. Since 1979, Pearson has worked in projects that investigate notions of culture, perception, identity and place, and the relationships between creator, environment, performer and witness-participant. Her work often involves spectral-temporal forms and sonic mimicry, and usually incorporates biospheric themes and stretched modes of attention, sometimes in process oriented contexts with community participants. Since 2007, she has explored telematic performance in audio and 3-D networked platforms, and since 2014 she has engaged in an ongoing project called Biospheric Art Practice, which questions artistic contexts in relation to the non-human environment. As a performer (flute, voice, tuned glass, accordion, virtual instruments), Pearson’s sound worlds reveal shifting nuances of texture, dynamic and tuning. Recent presentations include Root, Blood, Fractal, Breath commissioned by Contact Contemporary Music (Allan Gardens, Toronto, Canada, 2017); Weighting (works for dance and video commissioned by choreographer Lori Hamar, Victoria, Canada, 2017); Hunt (3) Chanterelles (Brown University, Providence, RI, 2017); Absorb (audio visual installation, commissioned by MediaNet, Victoria, Canada, 2016); Songs For Glass Island, with Camille Norment and Experimental Music Unit (Contemporary Art Gallery, Vancouver, 2016); PwRHm (w/helicopter) (networked media work, Firenze Media Arts Festival, Florence, Italy; 2016, Net New Music Festival Birmingham, UK, 2015; Experimental Media and Performance Centre, Troy, New York, 2014), Music For Natural History (performative installation, w/ Paul Walde, Royal BC Museum, Victoria, 2016), This Is For You (sound installation, ohrenhoch, Berlin, 2016 & 2015), among others. Pearson was editor of the Canadian periodical Musicworks initiating its audio component in 1983. 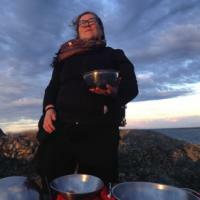 She designed and taught a sound studies course at OCAD University’s Experimental Department in Toronto for a number of years, and often presents workshops, guest lectures and talks on listening, biospheric art practice, telematic collaboration, and Deep Listening®. She was director of the Toronto New Music Co-operative (Toronto), is co-director of the new music organization LaSaM (Victoria, BC) and a member of the global networked collaboration Avatar Orchestra Metaverse.